Yamuna Expressway Industrial Plots scheme information are available on this page. You can find the allotment notification, procedure to apply, advertisement, important dates, place to purchase brochure, draw result dates etc. information of plots scheme June – July 2013. Recently, Yamuna Expressway Industrial Development Authority released an advertisement for allotment of Industrial plots (non-polluting units) nearby Yamuna Expressway. The allotment of plots will be made through draw process only. So, every person has the equal chance to get the allotted Industrial plot under this scheme with economical prices. Total number of industrial plots lie under this scheme are 600. 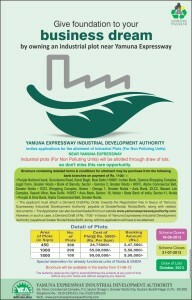 Download Form Online – You can download the application from the official website of Yamuna Expressway (www.yamunaexpresswayauthority.com/). In this case, you need to attach a demand draft of Rs. 1,100 /- in favor of Yamuna Expressway Industrial Development Authority payble at Greater Noida /Noida / Delhi with application form. Obtain Brochure From Banks – The brochure of the scheme can be obtained in the mean time by paying the amount of application fee from the given list of bank branches. The applicants are supposed to attached the demand draft of registration fee amount. Further information are available on the brochure please read that carefully. These banks are responsible for the distribution of brochure with application form as well as submission of application form with registration / application fee.